Just before Christmas, Drink Wise, Age Well launched ‘Calling Time – Addressing ageism and age discrimination in alcohol policy, practice and research’. A report which presents evidence of practice and service provision that is in breach of the 2010 Equality Act and effectively stops older adults who have an alcohol problem receiving the help they need. Having worked for many years as an alcohol practitioner I have often found myself feeling frustrated by the barriers and stigma shown towards older people with alcohol problems. This has ranged from various health and social care departments shunting people between services as they were either ‘too old, too complex, unwilling to engage…’ to other treatment decisions that are in effect a form of ‘writing people off’ due to their age. As a practitioner this just became the norm and something you had to ‘navigate’ in order to get the best possible outcome for the person you were supporting. The welcome arrival of the 2010 Equality Act meant that, for the first time, people could not be discriminated against due to their age and widened protection to not just employment, but to goods and services. From a practice perspective there is concerning evidence presented in the Calling Time report. An anonymous online survey of health and social care practitioners, which attracted 152 responses, revealed that there continues to be assumptions that alcohol problems predominantly affect younger people, older adults are ‘too old to change’ and that it is wrong to deprive older people of their ‘only pleasure’. Certainly for the majority of people, having an alcohol problem is far from pleasurable, and this is more the case in older adults where their drinking may lead to increased isolation and significant physical and mental health problems. There is also the perception that is too late to intervene with older adults due to potential life expectancy. This has never been my experience with the people we have supported in our older adults services. When the right support is in place people are motivated to make positive changes, and many experience the health and well-being benefits from doing so. 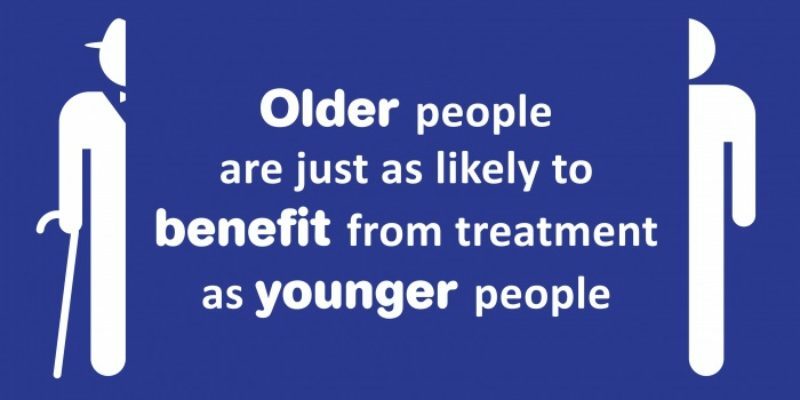 Some research has shown that while older adults are less likely to access the treatment, when they do, they have more positive outcomes than any other age group.